Aaron Maybin was an All-America linebacker at Penn State University and was drafted 11th overall by the Buffalo Bills in 2009. He played four seasons in the NFL for the Bills and New York Jets before retiring in 2014. He has since turned full-time to his art, chronicling his hometown’s challenges with poverty and crime through painting, photography and poetry, and he works as a teacher in Baltimore schools. Last winter, he became the outspoken face of outrage after many of Baltimore schools went without heat during extreme cold. 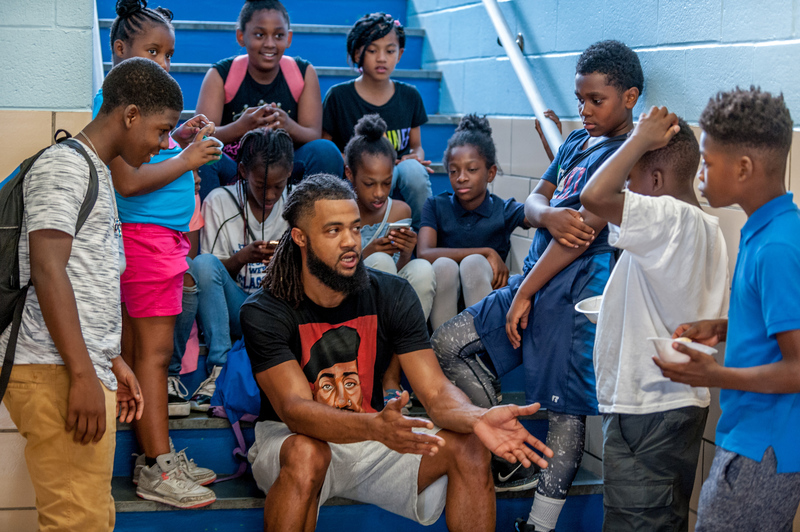 Here, as told to ESPN’s Kevin Van Valkenburg, Maybin tells about his journey from a life of football to working on behalf of kids from his neighborhood, how he connects with students and why he doesn’t see himself as a hero. Maybin stands in his home studio surrounded by his paintings. Maybin, talks to students at “Gallery Night,” an end of year art showcase at Matthew A. Henson Elementary School. Maybin, leaves a convenience store across the street from Matthew A. Henson Elementary School. When I retired from the NFL, it was the first time that I had really been able to lock into the art studio and not give a damn about what anybody had to say about what I was about to create. Nobody can fine me, nobody can kick me off a team, nobody can tell me I’m relegated to the bench. I can do whatever I want. I just started creating. That was amazing. Between that experience of being able to really have that intimate father time with my children and being able to have that freedom as an artist and as a writer to say what I wanted and do what I wanted, I just got happy again. My thing now as a father is: Why are you so quick to ask me if my kid plays football? Why not ask me if they’ve gone to a coding camp? With all due respect, it’s because you don’t expect that from my kids. You expect them to dribble a ball, to put a helmet on. There’s a condescending air to that, that always affects us in a way that it doesn’t necessarily affect other communities because you don’t even expect it from us. That’s why my kids are participating in art, in music, in learning another language, before they play in any organized sports. I’m exposing them to the world. If my kids have to play sports to accomplish success, then I failed. Now I’m teaching at a school in West Baltimore. I was always teaching, even when I was playing. Literally, I was in the league and in OTAs for three days and then coming home for the last two to do my workshops at the end of the school year before they got out, and then having my summer camp that was art- and football-based. I have kids that weren’t reading at the beginning of the school year that are reading now at above grade level. That’s a win. That’s a f—— win. You can’t measure it in a better way than that. Because of the fact that I only teach a few blocks away from where I grew up, I understand my students. I know the music they listen to. I know the people in the community that they look up to. I know what they’re afraid of. If you don’t live in that area or at least invest yourself in the area that you’re teaching in, you’re not going to have that kind of connectivity. That is what actually gives you the license to come in and educate in a way that they’re going to receive it. That’s big for me. Maybin, helps Kamiyah Beckles, 7, right, with a project in art class at Matthew A. Henson Elementary School. That was their honest reaction. But something that was more nuanced, actually, was talking about poverty. We were talking about the realities of what it means to suffer through poverty, and then we were talking about how it affects people. We were talking about why it is that it seems to be weaponized against our communities. The funny thing is, the realest conversations are with my third-graders. And the scary thing is that by fifth grade, these kids see the police as their enemy. They feel like they’re being targeted. They know this by the fifth grade. When I talk to them about Alton Sterling or Freddy Grey or Philando Castile or Sandra Bland, they know. The target demographic for my book, Art Activism, was middle school and high school. But let me tell you, I’ve seen my elementary school students do more with that book that I’ve seen anybody else do. Either something inspires them to paint something or to write something, or it’s just them reading an essay or poem and seeing a street corner that they know or seeing a photo of somebody from around their way. It’s like the light bulb goes off. There’s a lot of times where I’ll take certain songs by people that they know. We do the J. Coles and the Kendricks and Nas and all that. The other day we analyzed a Creek Boyz song, “With My Team.” If you look at the lyrics of the song, it’s powerful. They talk about how there’s too many people dying, too many people struggling with addiction, too much poverty. They’re doing it in a way that the older demographic has always shied away from because it’s so raw and so in your face. But tell me that you can’t get behind the message. A lot of times, as soon as people hear hip-hop, they turn their noses up at it. But if you’re really going to reach these kids, it’s at the point now where it’s not even just young black kids. If you want to reach these young white kids, you’d better know something about hip-hop because they love it. People still don’t get that you can love Mark Twain all you want, but go down to Sandtown, Freddie Grey’s neighborhood, and give one of his books to those kids and watch them rip it up and throw it in the trash. It won’t speak to them. They don’t see themselves in that. Adventures of Huckleberry Finn is never going to identify with them. Even The Catcher in the Rye, that’s not contextually relevant. But The Beast Side (by D. Watkins) and Raw Wounds (by Kondwani Fidel), these are books written by people that they either know or who understand them. They understand their language because they live around here. Maybin, takes a picture of Jeniya Coleman, left, with her artwork while Makayla Brown, 12, right watches during “Gallery Night,” an end of year art showcase at Matthew A. Henson Elementary School. I’m always uncomfortable when people throw the H-word around — as in Hero — because it makes it seem like I’m special, when honestly what I’m doing is supposed to be the norm. There are plenty of people out here like me, but because they’re not a former first-round pick, nobody cares that they get up every day and do the right thing and do the things that nobody else wants to do. If we’re going to actually make the city better, we have to make that the norm. I feel like people can conceptualize that only when they can see examples of it. Most of the stuff I’m working on is stuff that hopefully benefits my kids. I doubt that any of this will really change my life at all. I doubt that anything that we’re working on is actually going to make me feel safer in the presence of law enforcement. I doubt that. But just because you might not be the beneficiary of the work doesn’t mean that you just sacrifice a whole generation to whatever the present state of affairs might be. I want more people to feel like this is all of our responsibility. I feel like when you’re doing it in a way where you just put one person up on a pedestal, people tend to look up at that person in awe, and then do nothing themselves. Instead of praising somebody for digging this great hole, pick up a shovel. I don’t want praise for digging a hole. I want you to pick up a shovel and help me. This story appears in ESPN The Magazine’s Heroes Issue. Subscribe today!